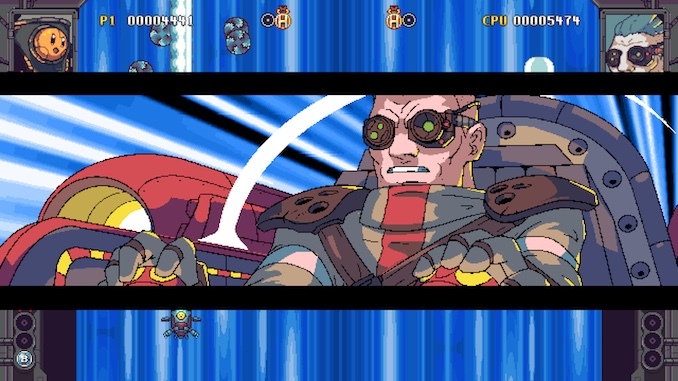 Our review of Rival Megagun, developed by Spacewave Software (a Canadian company!). Released on November 29, 2018 for PS4 (reviewed), Nintendo Switch, Xbox One, and Microsoft Windows. 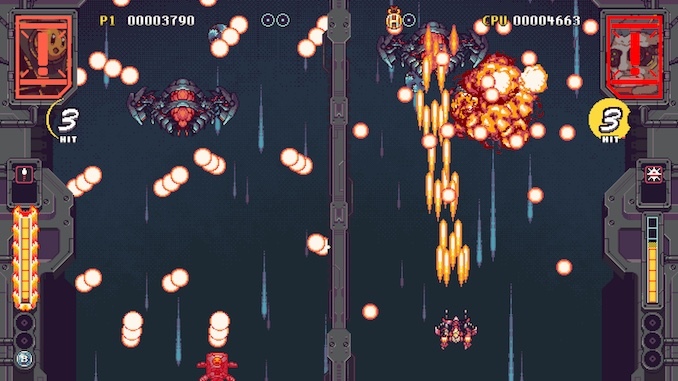 A split-screen 1v1 vertically scrolling shoot-em-up. 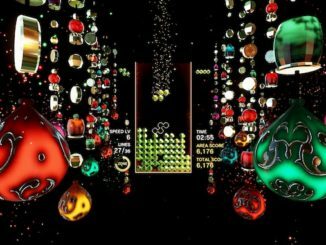 It’s as if someone mashed together Galaga X Street Fighter X 2-player Tetris. 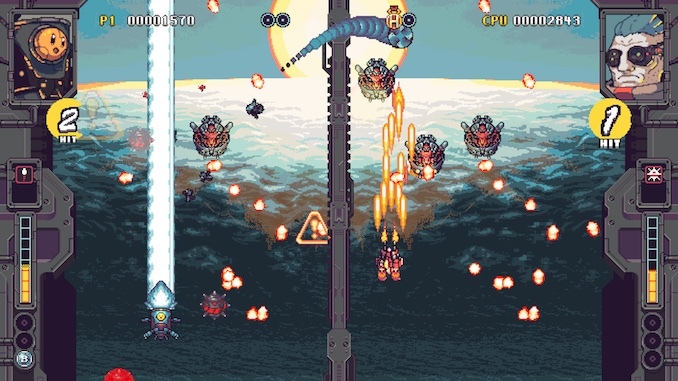 It is a novel and worthy attempt to shake up the shmup genre, with great chiptunes and wonderful 16-bit graphics. And it’s cheap! People who know what shmup means. Fans of classic gaming and retro graphics. Anyone with a couch and a roommate and $20. 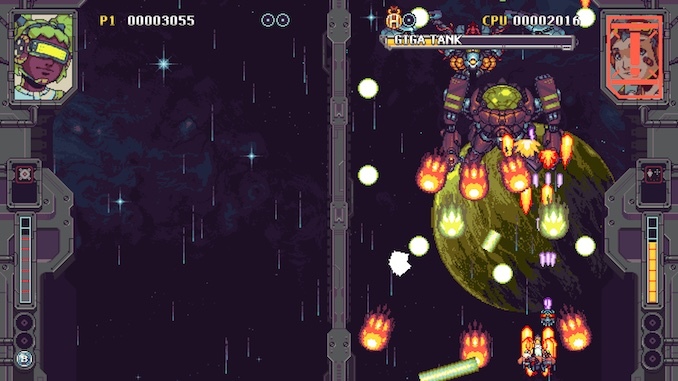 To say that the shmup, or shoot-em-up, genre is well past its prime is an understatement. 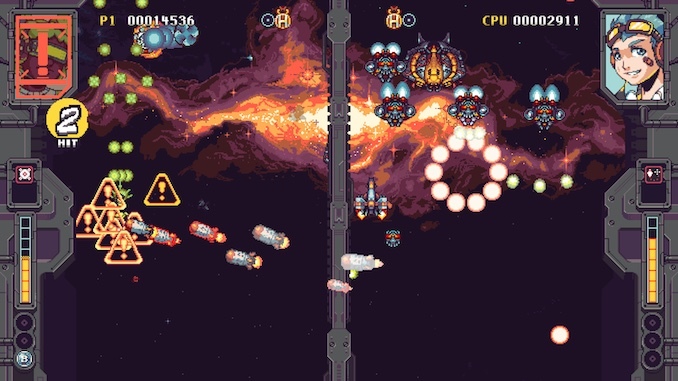 What was once a ubiquitous presence in arcades and on home consoles – think Galaga, R-Type, Raiden – has long since been relegated to obscure indie downloadables and even more obscure mobile games. It makes sense: the shmup was never really a candidate for revolution, let alone evolution: for three-plus decades we’ve been flying the same little 2D spaceships against the same lovingly-rendered 2D backgrounds fighting the same alien bad guys shooting the same screen-filling bullets. Heck, we can even pinpoint the precise moment the genre peaked, a brief window in the late 90s/early 00s when improvements in tech and the lingering influence of arcades resulted in a handful of masterpiece shmups. It’s generally agreed that games like Einhänder (1997), Ikaruga (1998), and Gradius V (2004) were the final iterations of a genre that had nowhere left to go. 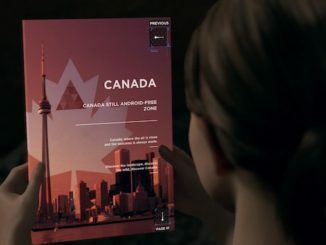 So, more than a decade on since perfection, here lands Rival Megagun, a low-budget Canadian indie title out now on a surprisingly diverse array of platforms. It doesn’t – can’t – surpass the greats, but it does at least attempt to shake up the genre. Welcome to competitive shmupping. 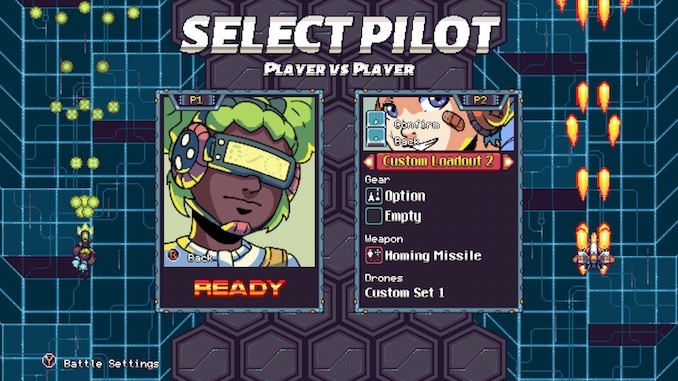 If you’ve ever played Tetris Attack, Dr. Mario, Bust-a-Move, or any other 2-player tile-matching game, you’ll grasp how Rival Megagun works: each player fights their own battle on their half of the screen, and the better you do on yours, the more difficult things become for your opponent. In a game like Tetris, that means more tetrominoes dropping against your opponent whenever you clear multiple lines. In Rival Megagun, that translates to extra enemy spaceships deployed against your rival any time you rack up a chain of kills. Rival Megagun actually does those puzzlers one better, by letting you take a more active approach against the other player. With shades of Street Fighter, each character in the (disappointingly small) roster has a set of unique special attacks, which run off a power meter. Spend part of it to unleash sideways(!) attacks – more on that in a moment – or risk trying to max it out for one very impressive super attack. Understandably, the game doesn’t exactly make it easy to max out the meter. For one thing, it takes quite a bit of time to hit 100%, in a game where rounds rarely last longer than a minute. For another, your secondary attacks – unique and very helpful special abilities that launch sideways onto your opponent’s screen – also consume a portion of the same meter. Very few of those secondary abilities are direct attacks – it’s not like you can just turn horizontal and shoot the other player, which would make the game way too difficult – but rather different kinds of projectiles that can create serious mayhem. These are again character-specific, and include things like heat-seeking rockets, bouncy glowing bullets, and a cascade of rockets that flies down screen. If all of this sounds overwhelming, well, frankly, it is. 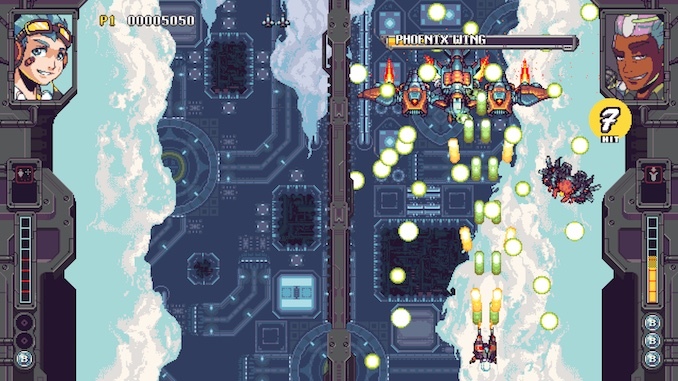 Shmups are a notoriously difficult genre, and with the added ability to sabotage another player’s run, perfection isn’t the goal here, merely survival. If it weren’t for the game’s generous release of health pickups, rounds would probably last mere seconds. It also shouldn’t be surprising that, given the diversity of abilities, there appear to be some balancing problems. It’s hard to gauge so early on, and there’s a chance the gaming community will eventually figure out each character’s strengths and weaknesses (again, shades of Street Fighter). But it’s hard not to shake the feeling that some characters are just better – especially those with nigh-unavoidable sideways attacks – while others are basically useless. Speaking of balancing, for a game structured around 1 v 1 play, it’s disappointing how bad the online matchmaking is. 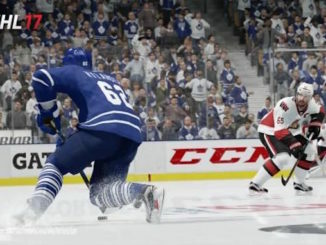 It can take forever to find a match, which is a big problem in a game where even hard-fought battles may be over in a minute. (To be fair, this is something for which I similarly faulted the most recent Call of Duty, proving it’s not merely an “indie” problem.) Even worse, you can’t really set any constraints in online battles, meaning that one player may come in with a supercharged load-out, the kind only unlocked by playing through the campaign multiple times. That’s plain unfair. It’s a funny thing: even though I’ve always loved Street Fighter, I’ve never been particularly good at it. Yet because the core gameplay is so good, even as I’m losing my Nth online match, I’m still enjoying myself. Conversely, Rival Megagun can’t exactly claim – nor does it aspire to – that kind of greatness. It’s a (new!) sub-genre in an already niche genre, one that peaked long ago. But – and this is all my decades of Raiden, Gradius, Space Invaders, Ikaruga, R-Type, Galaga, etc. speaking – there are times when I honestly enjoyed it more. That’s not going to be the case for everyone, but if you love the genre like I do, feel a certain nostalgia for it, or are just plain better at shmups than at fighting games, then $20 is a more than worthy investment. I really think there’s a great idea here, and given the right support, it’s the kind of game that could live on in tournament play and in dorm rooms everywhere. Plus, any game that requires that you spy on your opponent’s screen – to find opportune moments to sabotage your rival – is okay by me. Visit the official page for Rival Megagun here.